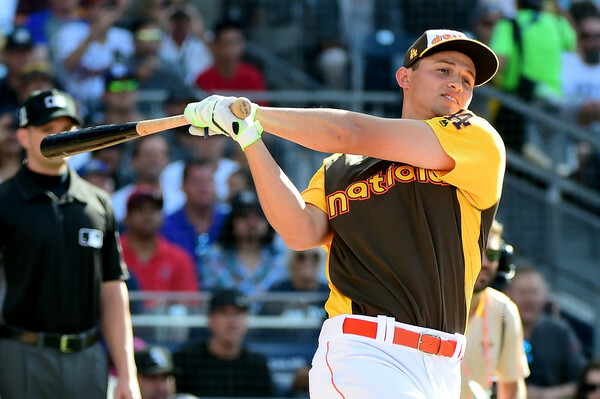 Corey Seager was eliminated in the first round of Tuesday’s Home Run Derby at Petco Park by Baltimore Orioles slugger Mark Trumbo. Seager, the first player to bat, hit 15 home runs off his father, Jeff. Trumbo will face Miami Marlins outfielder Giancarlo Stanton in the second round of the Derby. Stanton hit 24 home runs in the first round, more than any other player. The bracket proved to be a tough draw for Seager: Only Trumbo and Stanton hit more home runs than him. Todd Frazier (13 home runs) of the Chicago White Sox and Adam Duvall (11) of the Cincinnati Reds both advanced to the second round on the opposite side of the bracket. This entry was posted in All-Star Game, JP on the Dodgers and tagged Corey Seager, Home Run Derby by J.P. Hoornstra. Bookmark the permalink.